seniors to meet the challenges of time in the town we love. 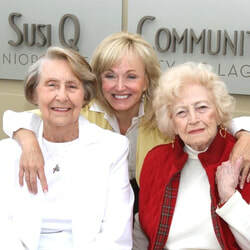 Make Laguna Beach Seniors a Beneficiary in Your Will or Trust. A planned gift to Laguna Beach Seniors in your will or trust enables you to retain your assets during your lifetime. You can give a specific amount, assets such as property, or a percentage of your estate or residual estate. We can arrange for an estate planning attorney to prepare a simple amendment to your trust or will at no charge. Charitable Gift Annuities. With an irrevocable contribution, you (and your spouse, if you desire) receive tax benefits and fixed income for life, after which the remaining principal becomes a gift to Laguna Beach Seniors. The Orange County Community Foundation issues and insures these annuities on our behalf. Life Insurance. If you no longer need its protection, transferring the ownership of an insurance policy to Laguna Beach Seniors can result in tax benefits for you as well as a generous gift to the Endowment. Charitable Remainder Trusts. You can obtain immediate tax benefits and provide lifetime income to you and your spouse. Thereafter, Laguna Beach Seniors can be the recipient of all or some of the trust principal. Retirement Funds. You can avoid potential estate and income taxes by making Laguna Beach Seniors the beneficiary of unused retirement plan assets. A direct gift of cash or assets is tax-deductible. Giving appreciated assets also avoids capital gains taxes. All gifts are welcome. A minimum of $10,000 qualifies for permanent recognition on the Susi Q Society Donor Wall.